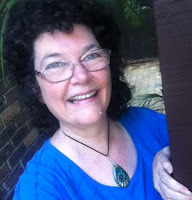 We're continuing with the great Aussie indie author coffee chat campaign. For the rest of 2016 I'm talking twice a week (sometimes thrice) with Aussie indie authors in my virtual cafe, where we'll talk about books, writing, what makes us laugh, and most importantly, how we have (or not in some cases) our coffee. This morning's guest is Brisbane author Jeanette O'Hagan. I've just poured my second cup of black plunger coffee. 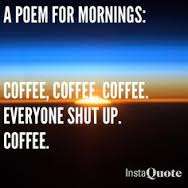 Yes, it's a two cup day today. My dog is on my lap, and I'm all set to welcome Jeanette to my virtual cafe. DL: Firstly, how do you have your coffee? Have your tasted changed since our last coffee chat? Jeanette: My tastes haven't changed - I still enjoy lactose-free cappuccino when out with friends, or moccona instant at home. You can read Jeanette's earlier coffee chat here. DL: Australia has had some pretty wild weather recently. Do you find you write better in stormy weather or blue sky weather? Jeanette: I can write in any weather as long as there's enough light and I'm relatively dry - I especially love windy weather (as in the Westerlies). I find it invigorating. And maybe it reminds of my childhood in Mt Isa. DL: Your stories have a theme of inspiration. What's the most inspirational thing to happen to you? Jeanette: With all the bad and shocking news we get bombarded with these days, it's easy to feel despairing about the world despite all the good things that usually don't make the news. I find stories of bravery and generosity against the odds inspiring and meeting Nick Vujicic (born without arms or legs) some years ago was very inspirational. Being immersed in nature, appreciating its complexity and beauty or even just taking in the vastness and beauty of the sky helps ground and inspire me too - so experiencing the grandeur of the Victoria Falls (Africa) or European Alps or Milford Sound (NZ) or seeing the Milky Way from rural Africa was totally uplifting. But I would have to say that what has inspired me the most is encountering a loving God often in the midst of the difficulties and despair and uncertainty. DL: You run a sci-fi/fantasy blog. Is this an area of writing you'd like to venture into? Jeanette: Fantasy is the genre I love the most - all my fictional stories, except two, are fantasy, written about my secondary world Nardva and in some way linked to the stories I started telling myself as a 9 year old - decades ago. This is true of my latest release, "Heart of theMountain" - and the last story I wrote 'Stasia's Stand' (sent off to a competition) and my current WIPs - Akrad's Children and Blood Crystal (the sequel to "Heart of the Mountain"). Of the two exceptions to fantasy - one is a contemporary piece ('Sandy: Perfect Plans' in Let the Sea Roar) and the other is a sci-fi flash fiction 'Space Junk' - recently published in the Mixed Blessings: Genre-lly Speaking anthology. Some of my stories have mystery and romantic elements and I am thinking I of writing another Sci-Fi piece but can't see myself writing contemporary or historical anytime soon. DL: Are you the only writer in your family? Jeanette: Good question. My daughter (grade 12) is not only an amazingly talented artist but writes great short stories (which I get to edit from time to time). My brother Tom has written some beautiful poetry and evocative fiction and also blogs on the environment. Otherwise - hmmm - my great-great grandfather was editor of the Charters Towers Miner - but that was a very long time ago. Jeanette: Unfortunately, being strictly gluten/wheat-free, my choices are somewhat limited these days - but I can't go past a pavlova with berries on top. Thanks for having me - once again I've enjoyed our chat and answering the great questions. 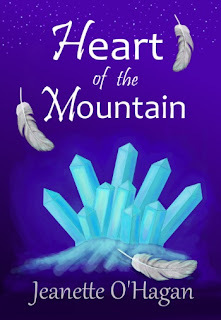 Today's featured novella is "Heart Of The Mountain"
Jeanette O’Hagan enjoys writing fiction, poetry, blogging and editing. She is writing her Akrad’s Legacy series—a Young Adult secondary world fantasy fiction with adventure, courtly intrigue and romantic elements. Her short stories and poems are published in a number of anthologies including Glimpses of Light, Like a Girl and Another Time Another Place. She lives in Brisbane with her husband and two children. or on Jeanette O'Hagan Writes (JeanetteOhagan.com). Good luck with the book, Jeanette. Now I want cake. Haha. Thanks for dropping by Adam. Cake is good. Thanks for dropping in Adam. What cake do you like best?